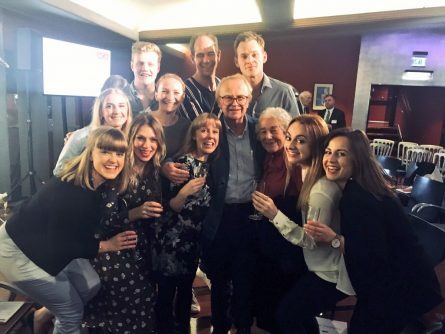 On 9th November 2017, much-loved children’s playwright David Wood OBE received the 2017 Action for Children’s Arts J.M. Barrie Award, in honour of his lifetime of unforgettable writing for children. 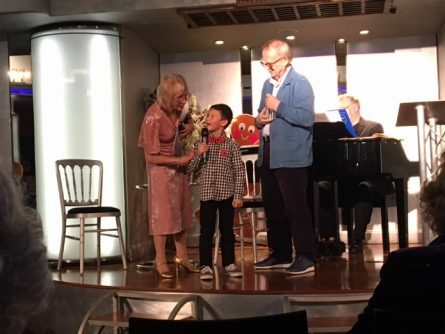 The award was presented by six-year-old Sacha Lee-Khan in a ceremony hosted by Delfont Mackintosh Theatres. Sir Cameron Mackintosh personally welcomed assembled guests, before a ceremony that included speeches from Maureen Lipman CBE and ACA patrons Philip Pullman CBE and Judith Kerr OBE. The J.M. Barrie Award is awarded annually by Action for Children’s Arts to a children’s arts practitioner whose work, in the view of ACA trustees, will stand the test of time. Previous recipients have included: Sir Quentin Blake CBE (2008) Roger McGough CBE (2009) Shirley Hughes CBE (2010) Lyndie Wright (2011) Baroness Floella Benjamin OBE (2012) Lynne Reid Banks (2013) Bernard Cribbins OBE (2014) Dame Jacqueline Wilson (2015) and Michael Morpurgo OBE (2016). 2017 is a marvellous year to celebrate David Wood’s life and achievements, as it is his 50th year of writing plays for children. He is an actor, playwright, composer, author, writer, director, producer and magician, who directs most of his own plays and writes the music for his songs. We think J.M. Barrie would be delighted to know that David has received an honour in his name; an honour that celebrates a lifetime of work dedicated to children, which will stand the test of time. He is indeed, a true and worthy recipient. Action for Children’s Arts also presented a range of awards for excellence in Children’s Arts including an Outstanding Contribution Award to TV composer Liz Kitchen and five Members’ Awards to Daphna Attias of Peut-Être Theatre; Hollie Coxon and Anthony Hope – The Sunderland Empire Theatre Creative Learning Team; Jude Merrill – outgoing artistic director of Travelling Light Theatre; Kate Prince from ZooNation and Gillian Rennie from Seven Stories.